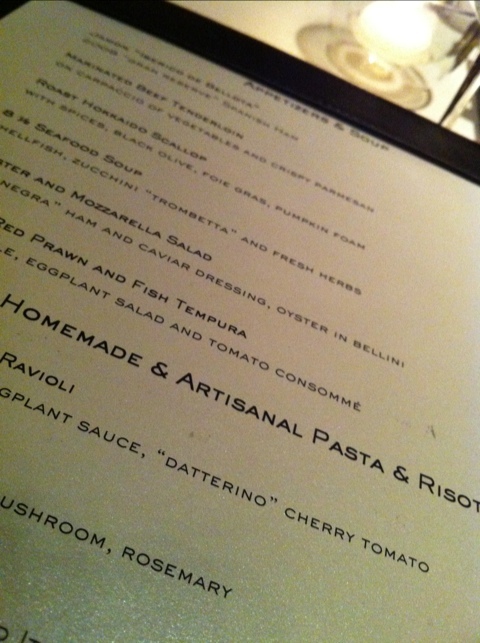 ‘The Mother’ and I had the pleasure of dining at 8 1/2 Otto e Mezzo on our first night in Hong Kong. Mind you, I made reservations about two weeks prior to us arriving and I’m glad we did! As the night went on, the restaurant got busier and was buzzing! Situated in Central at Alexandra House, this restaurant is quite snazzy. There’s a small bar up front and once u enter into the dining room, you are blown away by the modern decor and mirror ceilings – it made the restaurant a lot bigger than it seemed. 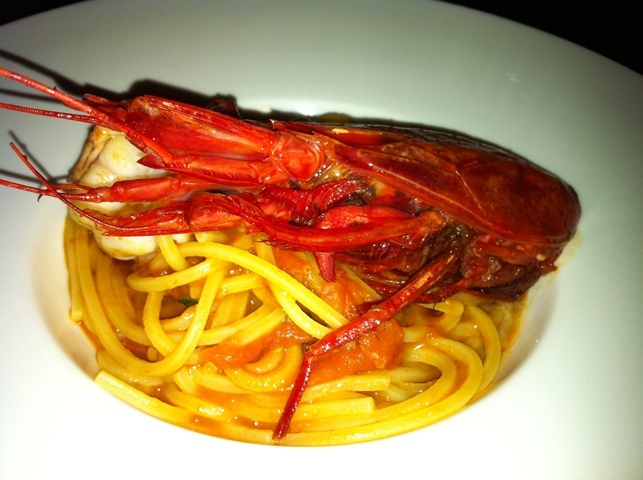 Otto e Mezzo is run by Umberto Bombana, ex chef at Toscana which was at Ritz Carlton and closed in 2008. 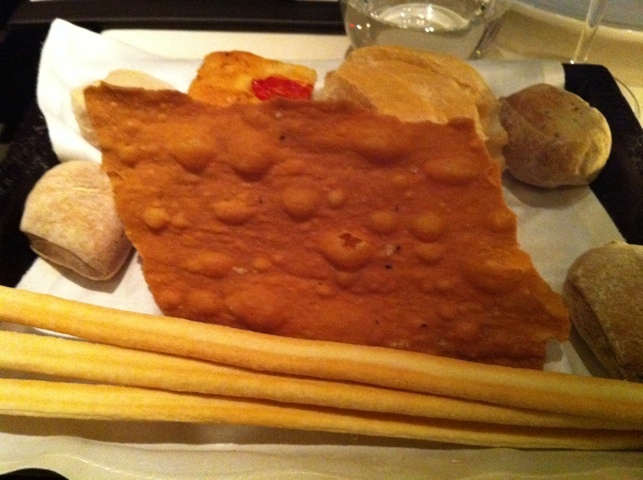 As soon we were seated we were presented with a basket of bread: bread sticks, sour dough, white, ginger snap like bread and many more. ‘The Mother’ and I made the mistake of polishing the bread basket and before we even finished the last couple of pieces we were presented with another! My goodness! Whilst we ordered we were presented with a wonderful amuse bouche, salmon sashimi cut into tiny bite size with avocado purée. My favourite combination! It was an absolute delight. 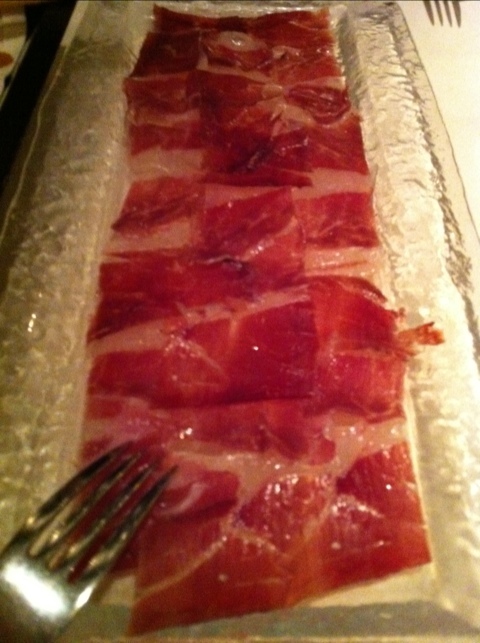 We shared the Jamon ‘Iberico de Belota’ which is dry cured ham. As you walk into the restaurant you can see legs of ham hanging and they looked fantastic and they were just that! The dry cured ham was thinly sliced with a slither of fat. It had a similar taste to prosciutto however it is cured longer and the texture is smoother and flavour slightly different. ‘The Mother’ opted for pasta, spaghetti with prawns which I was a little surprised. For some strange reason he always associate Italian cuisine with pasta. The spaghetti I thought was a little under cooked, I prefer it soft however the tomato base sauce was amazing! It had a strong prawn flavour without making it too fishy. My only gripe would be there was only ONE prawn, albeit a large one. Have a look at the large prawn head that was presented. 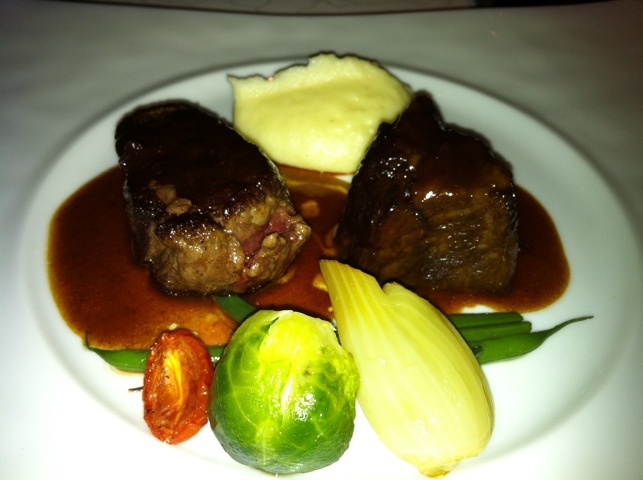 I on the other hand couldn’t go pass the beef short rib and beef tenderloin served with mash, beans and brussels sprouts. Wow! The beef short rib was served medium rare and was incredibly tender. The beef tenderloin was wonderful and just melted in your mouth! I didn’t know which one I wanted to end with. They were both totally and utterly delicious! We were too full for dessert. Rookie error in polishing the first bread basket. 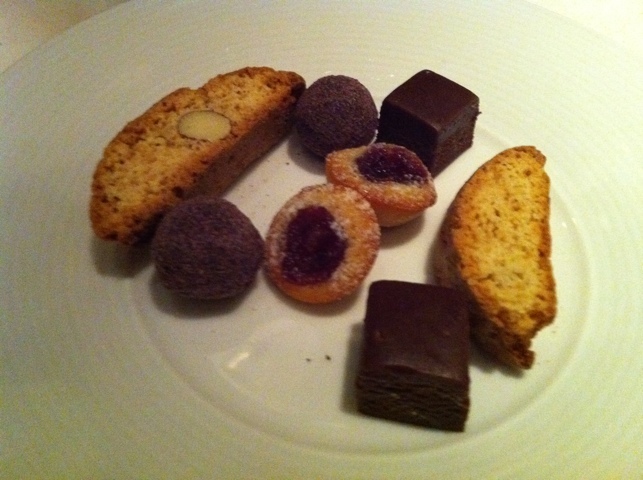 However, we were presented with some petit fours, a mixture of chocolate cake, dark chocolate with rum, biscotti and madeleines. I only had the bite size chocolate cake and it was way too sweet for my liking! ‘The Mother’ really enjoyed the biscotti though! It was a wonderful meal at Otto, the pasta was relatively simple but tasty, my beef short rib and tenderloin was awesomely good and service precise! Awesome and comforting food which we both enjoyed. My only gripe would be that the servings were a tad small! Probably the reason for unlimited bread. Regardless, it was enjoyable and a wonderful evening. Total bill came to HKD 1200 (AUD 160) with one glass of wine (‘The Mother’ didn’t want a drink), which was ok I thought. 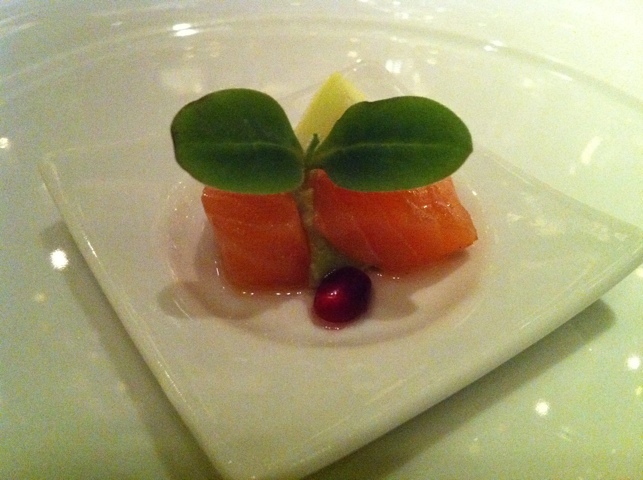 The salmon sashimi looks so cute, and yes, the bread basket is always such a temptress! Such a rookie error but can never say no to bread! That’s the biggest prawn I’ve ever seen – it looks like a mutant prawn from outer space! I always eat too much of the bread too – rookie error like you say. sashimi with avocado puree, that sounds awesome! the beef must be really good, salivating while i’m reading your description.